' ' Cinema Romantico: Who in The Big Short Wants the Oscar Most? Who in The Big Short Wants the Oscar Most? 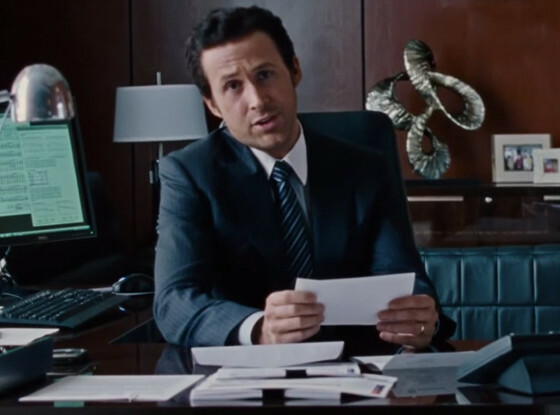 Adam McKay's "The Big Short" is based on Michael Lewis's 2010 book of the same chronicling a few fellas who detected the forthcoming financial crisis of the late aughts and bet against the market in order to reap a profit. The film, no doubt, will have much to "say" about "the world" in which we "live", and so forth. Most of all, though, it's a chance for heavy-hitting actors to try and win Oscars. And so, based on the trailer, we here at Cinema Romantico have attempted to determine who in this top-level cast wants the Oscar most. Unfortunately this is the only shot we have of Ms. Tomei because nameless strippers are featured more prominently in the trailer than Marisa Tomei which goddammit, Hollywood, pull your heads out of your asses. But anyway, we do not necessarily believe Ms. Tomei wants an Oscar all that badly. First, she has an Oscar. Second, she should be in everything and I'm reasonably certain Mr. McKay knew that well enough to cast her. 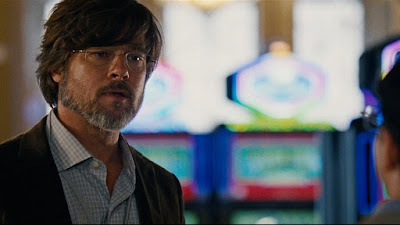 Frankly, I expect more from going-for-an-Oscar Brad Pitt. This looks spur-of-the-moment. This looks like right before Brad left the house for the first day of filming Angie tousled his hair and gave him some glasses and said, "Don't forget...awards! Say it three times fast! AWARDS!AWARDS!AWARDS!" 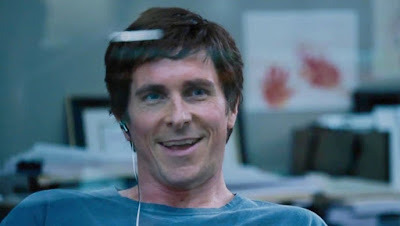 He's got the accent and the deliberately bad hair cut but, really, for Bale, he's only operating here at about 40% of his full Method capabilities. I imagine he originally signed onto this movie under the agreement he would take all the principal roles, Peter Sellers-style, only to have that part of the contract written out at the last second. First, Gosling dove headfirst into a bucket of bronzer. Then, he did one of those "Face/Off" face transplants with Ryan Reynolds. I assume somewhere out there Ryan Reynolds is trying to win an Oscar by looking like Ryan Gosling. Maybe next year? Your comments on Gosling are giving me life! Ha! Thank you! I was just hoping other people saw Ryan Reynolds when they saw Ryan Gosling in this too.